I think having too many choices is bad. The best app (or software, or phone, or …) is the one you know how to use, and use it well. Just pick one! Then use it. Explore the settings, explore the menus, experiment, read the Help screens. For example, I picked The Weather Channel as my app. It works the same on my iPhone as it does on my Android devices. When I first open it, I’ve learned to just scroll down (swipe up on the screen) until I see what I want – Radar screen, for example. When I keep scrolling down, just below Radar & Maps is an option for Road Conditions. I tap on that and get a map, then I tapped on the Layers button and see all sorts of choices. Hey, look at this: Wind Speed. Good to know! Avoid driving thru the dark blue and purple areas! We heard lots of horror stories about windstorms in the desert just yesterday. Here is another, really cool, wind map. 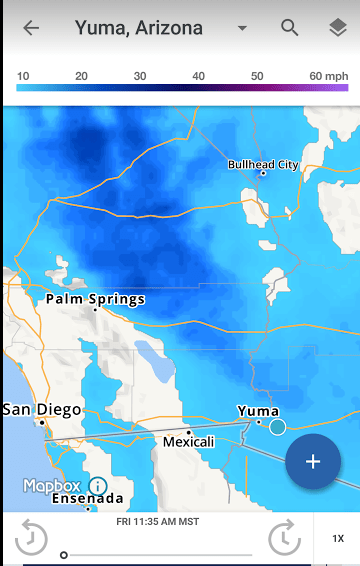 You can actually see the movement of the wind in real time on this map from Hint.fm. It is important to keep your apps up to date. Sometimes the updates will be little bug fixes and sometimes they are major new features. You can view “what’s new” in the description of the update. To learn about how to manage updates to your apps, see our What Does This Button Do show, episode 14: Updates. Published by MrsGeek, in Blog. Tagged with Weather. For me dark sky locates me about 20 miles away and 3000 feet higher in elevation. Different weather there. Prefer Storm app, works on both ios and Android.